Carol Hinton (center) received the 2017 Farm Public Relations Award at Kentucky Farm Bureau’s annual meeting in Louisville. Presenting the award is B. Todd Bright, KFB Communication Division Director (left), and David S. Beck, KFB Executive Vice President (right). 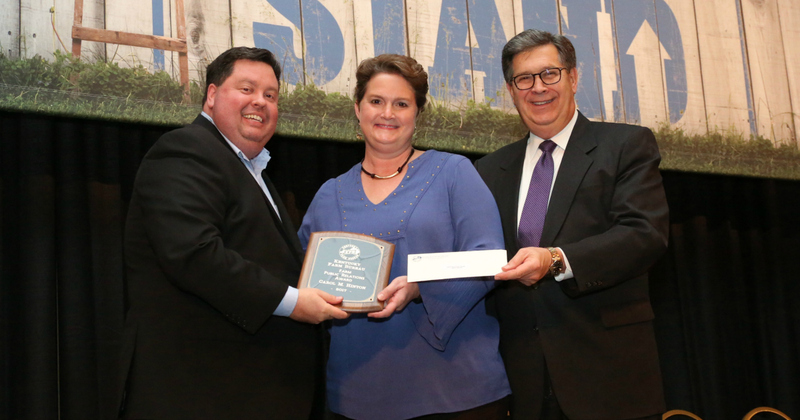 Louisville, KY (December 1, 2017) – Carol Hinton, a Breckenridge County Extension Agent with University of Kentucky Cooperative Extension, is the recipient of Kentucky Farm Bureau’s (KFB) Farm Public Relations Award. She was recognized on November 30 during the general session of KFB’s annual meeting at the Galt House in Louisville. Having grown up on a farm in Hardin County, Ms. Hinton has worked as the county extension agent for the past twenty four years. She was one of the first female agriculture agents in Kentucky. As the county extension agent, Ms. Hinton works with the community in determining, prioritizing and addressing county needs relating to agriculture and natural resources. In addition, she counsels with community members to provide input and feedback regarding extension’s work in the area. She designs and implements programs based on identified needs and provides educational opportunities. Ms. Hinton also creates multiple newsletters, flyers, and Facebook posts that produce awareness about current topics in the agriculture industry. These efforts have resulted in positive promotion of agriculture in Breckinridge county. A graduate of Western Kentucky University and the University of Kentucky, Ms. Hinton serves with many professional organizations including the soil conservation committee, Chamber of Commerce, and the Kentucky County Agents Association, to name a few. She currently has her own farm where she raises show pigs. Ms. Hinton is the recipient of many awards related to her work including a Newsletter Award from the Kentucky Association of County Agriculture Extension Agents, a Diversity Award from the University of Kentucky, and a Supporting Agent Award from the Air and Waste Management Association. Ms. Hinton was nominated for the KFB Farm Public Relations Award by Breckinridge County Farm Bureau 1st Vice President Greg Moore. To download a photograph of Carol Hinton, click here.